Today marks the 100th anniversary of the birth of composer Samuel Barber, and his alma mater, the Curtis Institute, has been celebrating the late composer with a series of concerts all over the country played by a chamber group consisting of students, alumni and faculty called Curtis On Tour. Among the pieces they are playing: the Barber String Quartet, Op. 11. The middle movement of this piece is the music we know as the Barber Adagio for Strings. "I think if that was the only piece he ever wrote, he'd be one of the greatest composers that ever lived," said violinist and Curtis Institute professor Ida Kavafian, who is the faculty member playing on tour. Left to right: Kavafian, violin; alumnus and faculty member Peter Wiley, cello; Hyo Bo Sim, viola; Yekwon Sunwoo, piano; Benjamin Beilman, violin. Photographer Jean Brubaker. "I don't think I've ever gotten through it without tearing up, even in a concert," Kavafian said, "One of the most emotional times I played it was after 9-11, for the firemen who perished. There were some members of the family, and also guys that did survive, or didn't get the call to go down there, who were at the concert. That was rough." Barber wrote the quartet for the Curtis Quartet, though it was premiered by another group. The current performances of it became all the more poignant because of the recent death of cellist Orlando Cole – "Landy" -- a founding member of the Curtis Quartet and longime cello professor at Curtis. "Of course (Barber) was very close to Landy," Kavafian said. "Until very recently, I had this dream that this quartet would actually go and play the (Barber) quartet for him. So I was very saddened that I never had the opportunity to do that, although I know that he's coached the piece pretty recently with other groups here." Barber actually wrote a letter to Orlando Cole while he was in the process of writing the quartet. 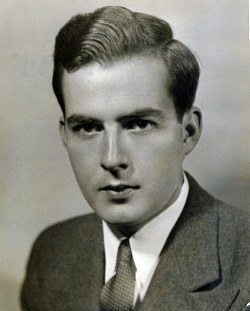 Samuel Barber, 1932, as a student at Curtis. He entered Curtis at its opening in 1924 and remained until 1934, studying piano and voice as well as composition. Photo courtesy of Curtis Institute of Music Archives. "Being his friend, (Barber) was in communication with Landy as he was writing the quartet," Kavafian said. "When he finished the second movement, he wrote this letter, and it said, 'I just finished the slow movement of my quartet today – it is a knockout!' and he underlined "knockout." I think that was probably the understatement of the century!" Violinist Ben Beilman, who a student of Kavafian and is playing in the Curtis tour, has played the Adagio a number of times before this, including the version for string orchestra, and has studied the Barber Violin Concerto. I asked him what he thought of the music of Barber. "Barber obviously has this incredible ability to convey emotion. In he first and third movement of the quartet, there's almost a dark veil, occasionally. The violin concerto is a lot more expansive, more exuberant and outgoing. But emotion is the biggest thing that comes to mind; how much he decides to either go all the way – or what he decides to reserve and hold back, which adds even more tension and intensity to it." "The third movement is minuscule, it takes maybe a minute and a half to play," Ben said. "My first reaction to that – and I actually said this to Mr. Wiley – 'What happened? Was he late for an editor, was he late for a deadline?' Mr. Wiley kind of thought for a second, then he said, 'Do you really think that, Ben? If you had just written that second movement, how would you follow that with another third movement? How could you possibly imagine bringing new ideas to a piece that already seems complete?' So the third movement is kind of an echo of the first movement, like the last heartbeat after the huge emotional movement that is the second movement." It occurred to me that it might be a little intimidating for a student to play with a faculty member – particularly the superstars at Curtis. "It's exactly as you'd expect – it's everything from terrifying to inspiring, and I know it's one of these experiences that I'm going to take with me for a very, very long time," Ben said. "Mr. Wiley was the cellist with the Guarneri quartet, and Ms. Kavafian – together they were members of Beaux Arts Trio. They have tons of experience rehearsing and listening to each other, and it's amazing how quick and how succinct so many of their comments and their ideas can be, to really throw the music into a new level. For a student, that would take a full semester – with tons of coaching -- to solidify." For Kavafian, it's a unique kind of teaching opportunity. "As long as I've been here, I've played alongside students in groups," Kavafian said. "I think it's a different and more effective way of coaching – you can say things until you're blue in the face, but if you show it by example, it's very different. And you can also learn so much about rehearsal technique and generosity of emotion in a concert. There have been a lot of performances here in our hall of faculty and students together." The Curtis on Tour concerts this month not only feature the quartet by Barber – one of Curtis's most famous graduates – but they also feature world premieres of works by two young composers that currently go to Curtis: "Lullaby: no bad dreams" by Christopher Rogerson and "Sonata for Viola and Piano" by Daniel Shapiro. "I run a festival in New Mexico – Music from Angel Fire – and I bring ten to twelve Curtis students to it," Kavafian said. "For the last five years I've had a composer as one of the young artists." It's important to allow the composers to become part of the musical community and to bring their works to an audience. "Christopher Rogerson was my young composer in residence last year, and Daniel Shapiro is going to be the one for this year." Curtis On Tour will perform five more concerts in March: one tonight in New York City, then stops in Kennett Square, Pa.; Orono, Maine; Rockport, Maine and Highland Park, Ill. More information here. Oh my goodness, what an astonishing recording, what an astonishing voice Barber had! I had no idea. I'm a huge fan of his VC and I'm thrilled to learn the Adagio for Strings is part of a quartet - I'm off, right this minute, to hunt it down. A wonderful article/blog. Thanks, Laurie! Thank you for such a great article! Only recently did I hear the Adagio for strings for the first time (Where have I been?!). I was so wrapped up in the emotion of it! It is definitely a piece that grips you so deeply. I imagine it evokes such tangible emotions in every listener. I remember thinking that it would make an excellent soundtrack for the crucifixion of Christ! It is SO emotional. Truly beautiful music.